While compression is an integral part of almost every mix you’ll ever do, it is still somewhat misunderstood by many. 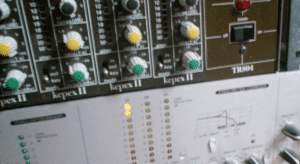 It stands to reason, that multiband compression is even more of a mystery, particularly to those that are just starting out mixing in home studios. Fortunately, the basics of this useful tool are pretty easy to understand. As we explained in our article in our ‘What is Compression?’ article, compression is simply controlling the dynamic range of a track, which is the level difference between the quietest point on a track and the loudest spot. The goal of compression — typically — is to reduce the amount of that range while still allowing the track to retain enough volume differentiation to sound natural. That goal requires something of a balancing act, often with minute adjustments of the main controls of a compressor: Threshold, Ratio, Attack and Release. Some tracks, however, require even more fine-tuning, which is where multiband compressors come in handy. Multiband compressors allow you to control the dynamics of the track in the same way (and with the same controls) as a traditional compressor, but it allows you to use those controls on two or more separate frequency ranges within one track. A traditional compressor applies the same settings to the entire frequency range of a track. Typically, a track will be divided into at least three different frequency ranges that you can apply separate compression settings to. Not only will you be able to control the bands individually, most compressors will give you a separate meter of the amount of compression for each frequency range, which provides a great way to monitor the track. Multiband compressors are most often found in mastering studios, as mastering engineers use them to precisely add compression to master tracks, but they also can be great for individual tracks when you are the mixing stage. Often they are used as problem locators (and solvers) in the mixing process. After you become comfortable using a compressor in your home studio, you’ll begin to be able to quickly hear when you have unnatural sounding compression. Sometimes, however, “fixing” the problem becomes difficult. For example, say you have a vocal track that is sticking out in a final mix because it is overly compressed. The natural solution is to pull up the compressor and reduce the amount of compression. Often you will find, however, that lowering the amount of compression adversely affects the rest of the sound of the track. In a case like this it is easy to see how being able to fine-tune the compression of certain frequency ranges can be a great addition to your mixing arsenal. Multiband compression also is a great tool to use on drums or other times your recorded tracks have a large amount of bleed.